This guide is aimed at farmers who are considering diversification into horticulture. It assumes a sound and system-based understanding of agricultural systems, but limited knowledge of fruit and vegetable production. 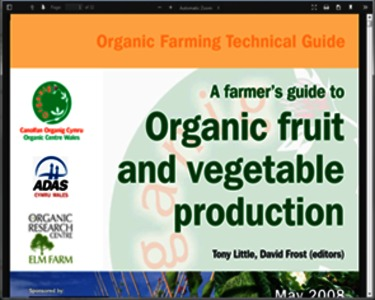 It gives a general introduction on organic systems and soil fertility components including factors and examples of successful crop rotation. For the main pests and diseases simple and system-based measures are highlighted, as e.g. considering the right timing of control measures, crop rotations and tillage. For weed management weeding machinery is briefly explained. Basic questions on how to choose the right variety and the equipment for weeding, harvest, and storage are discussed. Additionally, the guide gives a rough overview and understanding of energy and greenhouse gas emissions and possible adaptation measures on farm level. The economic aspect are separately highlighted with a given example. Summing up, horticultural farmers, get an overall guideline to establish a system sound production of field and fruit vegetables, including fertility building strategies and protective structures. Useful addresses of advice services, certification bodies and research Centres are listed up for Welsh farmers.